Hi, it’s been a while! Life has been quite busy with the business and an extra two kids since I last wrote on the blog so I apologize for the lack of updates. Over the past few years a lot has changed, among them being the make-up of my RC Helicopter fleet. I’m no longer flying 450-sized models, except for the scale BO-105 that is down for maintenance. I still have the Radikal although it, too, is down for maintenance. Since my last update, the Radikal was converted to a flybarless head and it flew first with a Mikado Silverline VBar and then an iKON2 flybarless unit. My preference being the iKON2 for its ease of programming and more natural feel. The current fleet is made up of the above named helis along with an Align 600N DFC, Align 700E DFC (with a 3G Flybarless head instead of DFC), and a Goblin 700 Drake (Thunder Sport). I love flying all three and I couldn’t tell you which is my favorite, they all have their unique and distinct characteristics that make them a pleasure to fly. Now that we’re past the pleasantries, let’s talk about blades. I was on a trip to Dallas last week and I listened to the TellARotor RC Podcast Episode 16, with Nick Maxwell as the guest, covering rotor blades. The episode was outstanding in describing the various rotor blade characteristics. 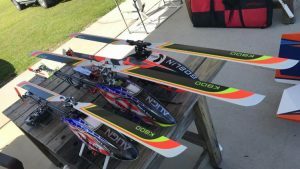 One notable revelation that made a lot of sense is that modern flybarless units will, for the most part, “hide” the difference between sets of blades due to the compensation and control the units provide. For example, a blade that might be a little quicker on the cyclic would be slowed down because modern flybarless units are measuring and outputting a desired and commanded cyclic rate. Absent a re-tune of gains and rates in the flybarless unit, two different blades should perform similarly in the air. That said, this is an oversimplification because there’s way more to blades than just cyclic rates so let’s chat about my experience with the KBDD Extremes. I was just asked to join the KBDD team a few months ago. I’d used KBDD blades in the past and they are a great bargain, especially the plastic tail blades. I would say they’re highly underrated since they’re not the “big name” blades that get way more attention. My buddy, Erich, sent me a set of 710 Extremes for my Align 700 a few months ago. I threw them on to see how I liked them over the Align 700 blades. Since the airfoil has a wider chord, this made my collective range essentially more aggressive so I had to tame that down for my F3C flying. The first thing I noticed is that the extra 10mm length and wider chord, paired with the extra mass kept the rotor spinning for much longer after spool down. After getting on the team, I acquired blades for the rest of the birds and one thing that became clear is how much more mellow they seemed. I don’t fly 3D, I prefer big air and all three helis seemed to enjoy “hanging” and staying put in straight lines over the other blades I had flown (Align 700s and Switch XF 603s). I noticed the blades have some extra “pop” and they have a higher pitched bark to them, but what Erich REALLY wanted me to try was the auto-rotations. I was fresh off a few crashes so I had been very gun-shy on trying auto-rotations, which is what I finally started doing this and last weekend. First thing is that I could see there was extra time to freak out since there was more mass. That said, I had to be easy on the collective and cyclic due to the extra chord, so bleeding off headspeed would happen faster when inputs were given. Today, I tried doing autorotations while in fast forward flight and they were just a pleasure. The blades have a great sound and I was able to hit close to the mark I was aiming for each time. Even if I was a little bit off track, there was plenty of RPM remaining to make some last minute corrections and “hang” above the mark until the heli was ready to land. Overall, I love the blades. One last advantage of flying the KBDD Extremes is the visibility. The orange & highlighter yellow on top are visible from a distance and the solid orange bottom is there to remind you of what orientation the heli is in. Finally, paired with the trademark crazy-bright KBDD tail blades, you will never struggle to see where your heli is and what direction it is heading! KBDD Products can be found at HeliDirect.